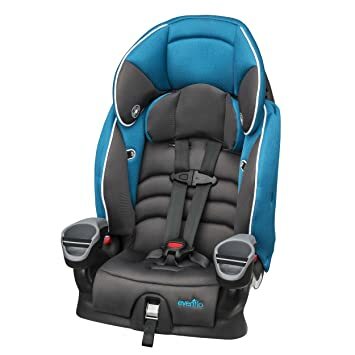 The Graco Highback Turbobooster Car Seat fits your child in highback mode from 30-100 lbs and converts to a backless booster for children 40-100 lbs. It features a multi-layer head rest and full coverage back support in highback mode. The open-loops belt guides help to position your car’s seatbelt, which makes it easier for your child to self-buckle. Other features include wide, padded armrests and integrated cup holders and storage. 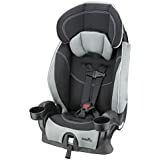 The Evenflo Maestro Booster Car Seat Thunder is a 2-in-1 combination seat that protects harnessed children from 22-50 lbs and belt-positioned children from 40-110 pounds. This 5-point harnessed car seat converts to a belt-positioning booster seat for extended use as your child grows. This type of seat is known as a toddler booster seat, or combination car seat. This car seat is lightweight and comes equipped with LATCH systems for easy installation and transfer between multiple vehicles. There are also 2 integrated cup holders to keep your child’s drinks nearby without increasing the width of the car seat. This allows multiple car seats to fit your back seat. The auto-adjust belt path correctly positions the seat belt to your child for a proper fit. There are 4 shoulder harness positions and 2 crotch buckle positions for extended use. 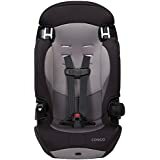 The Cosco High Back Booster Car Seat is a 2-in-1 combination seat that protects harnessed children from 22-40 lbs and belt-positioned children from 40-80 pounds. This 5-point harnessed car seat converts to a belt-positioning booster seat for extended use as your child grows. Features include 5 point harness with up front adjustment and 2 position shoulder belt guides. It has a lightweight design for easy traveling. There is a removable cup holder. 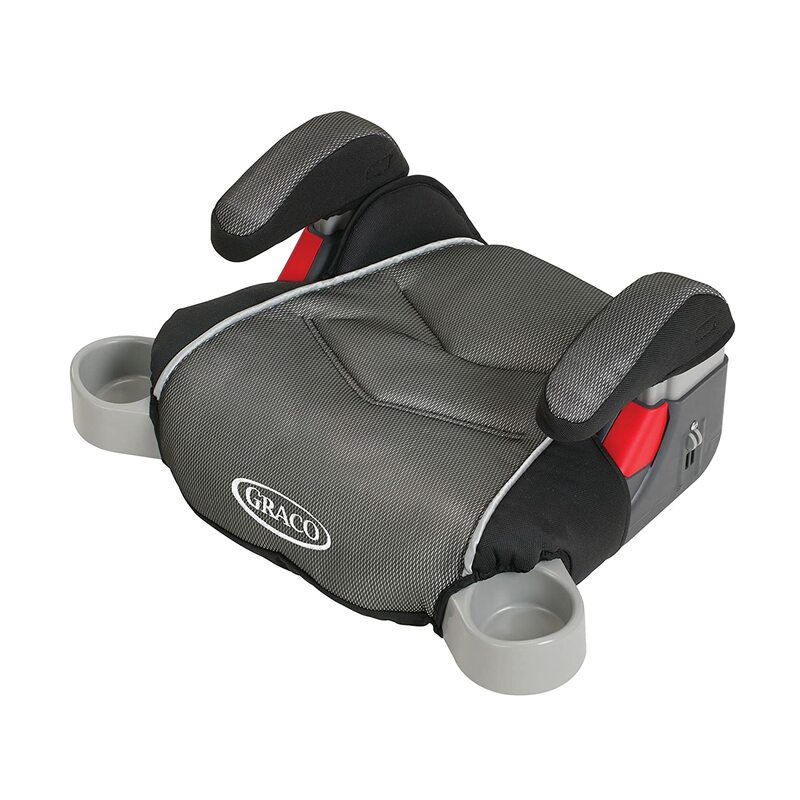 The Graco Affix Youth Booster Seat fits 30 – 100 pounds and from 38 – 57 inches tall. It converts to backless mode for children 40 – 100 pounds and from 40 – 57 inches tall. It has one-hand front-adjust Latch system, making self-buckling easier. There are 2 integrated cup holders, perfect for holding your child’s drink or snacks. There is a hideaway storage compartment for storing small games and toys. This car seat has 6 height positions, where the back adjusts as your child grows, keeping the head and side support in the proper position. It’s 2 seats in 1, where its removable back transitions to to a no-back booster. Other features include comfortable padding around the head and body and one-hand, multiple height adjustments to accommodate growing children longer. There are elastic cup holders so that your child can keep his snacks closeby. This belt-positioning booster seat is designed for children from 40-100 pounds and between 43 to 57 inches tall. It features a pull out storage drawer that keeps your child’s gear closeby while they remain safely buckled into the seat. It has a seat belt positioning strap for a customized fit. There is also a built-in cup holder and an additional storage pocket on the sides of the seat. It easily converts to a backless booster when your child is ready for the next stage. The Graco Backless TurboBooster Car Seat fits children from 40-100 pounds and up to 57 inches tall. Features include padded, height-adjustable armrests, one-hand adjustable headrest, and hide-away cup holders. The padded seat cushion can easily be removed and washed in a washing machine. This belt positioning backless booster car seat by Kids Embrace fits kids 40 to 100 lbs and up to 57 inches n height. 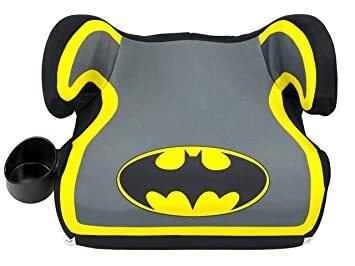 This cute seat is perfect for Batman lovers! The contoured seat is shaped for comfort, even on long journeys. It has a seat cover that can be easily removed, wiped off, and is machine washable. Other features include 1 cup holder and a shoulder belt positioning clip. There’s a Batgirl version of this car seat, perfect for young girls. Kid Embrace also makes a Superman booster seat in blue and pink. This belt-positioning booster fits kids from 40-100 pounds and up until 57 inches tall. There is an adjustable headrest that grows with your child. The seatbelt positioning strap gives your child a customized fit. There is a built-in cup holder on one side and additional storage pocket on the other sside o that your child can keep a snack or drink nearby. There is a pull out storage drawer, which is great for keeping favorite toys or books. This seat is available with a high back that can be converted to this backless booster seat. 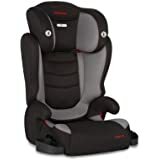 The Evenflo Amp Performance No Back Booster Car Seat fits children from 40-100 lbs. Features include comfortable, contoured padding, elastic dual cup holders and tall armrests. The car seat pad is also machine-washable. The Evenflo AMP is available in a variety of colors. This belt positioning booster fits children from 40 to 100 pounds and up to 57 inches. Its lightweight design is perfect for traveling. 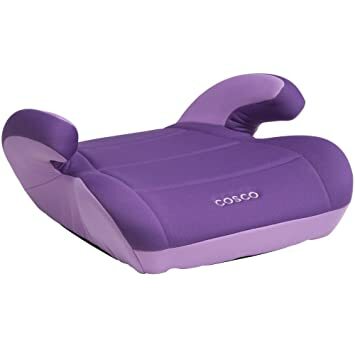 Although this purple color is only available to Amazon Prime members (30-Day Free Trial ), the car seat is available in a variety of colors to everyone including yellow, turquoise, and magenta. 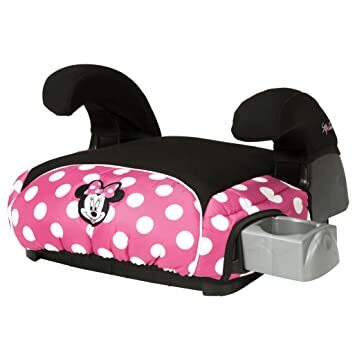 This Disney Deluxe Belt-Positioning Booster Car Seat by Safety 1st is perfect for young girls. It is specifically designed for children who weigh 40-100 pounds and between 43 to 57 inches tall. It lightweight design makes it easy for traveling and transferring between cars. There is a slide out cup and snack holder. There is Mickey Mouse version of this car seat, perfect for young boys. 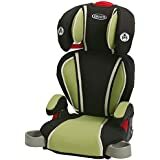 This entry was posted in Booster Car Seats, Car Seat Deals on December 3, 2018 by admin. 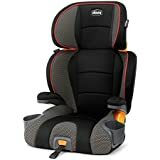 When your child is ready for a booster safety seat, you may want to take a look at the best booster car seats 2019. A booster seat has a 3-point belt system to keep your child restrained. It is the best way to keep your child safe until he is big enough to fit your car’s seat belt. 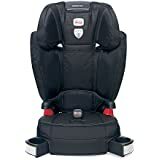 Below are booster car seat reviews. The Graco High Back TurboBooster child car seat is one of the narrowest high back booster that fits children from 30-100 lbs. You can easily converts it to a backless booster so that you can use it for longer as your child grows. At just 16.5 inches wide, it can easily fit into small spaces. The cup holders fold into the seat when you need extra room. 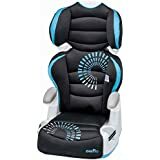 This toddler car seat booster features a multi-layer head rest and wide, padded armrests for extra support and comfort. The open-loops belt guides help to position your car’s seatbelt, making it easier for your little one to self-buckle. For more, check out a list of the narrowest booster seat on the market. The Evenflo Big Kid AMP booster seat fits children from 30-110 pounds and from 38-57 inches. It is 2 seats in 1, meaning you can convert this from a high back booster to a no back booster. In the backless mode, this booster seat fits children starting 40 pounds and 40 inches. It features easy, one-hand, multiple height adjustments and belt path that helps position the seat belt to your child. The booster also comes with integrated, dual cup holders. 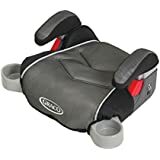 This Diono high back booster seat fits children 40-120 lbs. and 38-63 inches tall. 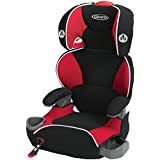 One of the safest booster seats, it features extra-deep side walls that are reinforced with aluminum and lined with EPS foam for superior side-impact protection. The Monterey XT expands in both height and width to accommodate your growing child. There are integrated LATCH connectors and front adjusters for a secure and safe installation. There are retractable, dual cup holders and snack trays. The car seat cover is removable so you can easily wash it and keep it clean. This Diono booster seat also easily converts to a backless booster. The Britax Parkway SGL Belt-Positioning Booster fits children from 40 to 120 pounds. The Parkway SGL is Britax’s safest belt-positioning booster seat with SafeCell Impact Protection. Its ISOFLEX LATCH connection system secures the booster seat to your vehicle, preventing it from becoming a projectile when it’s not in use. This helps to protect both your child and other car passengers. With the Britax SGL booster, you can change the height with just a push of a button, so that your child can fit comfortably in the seat as he grows. Its SecureGuard Belt-Positioning Clip prevents children from sliding under the lap portion of the seat belt during a collision. 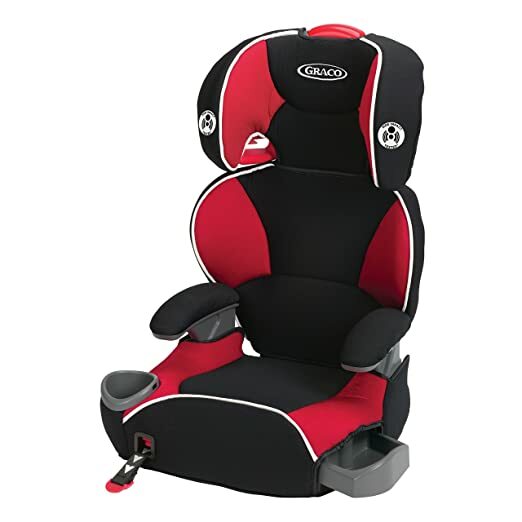 The Graco Affix Youth Booster Seat with LATCH system is one of the most popular booster seats and is very affordable. It fits 30 – 100 pounds and from 38 – 57 inches tall. It converts to backless mode for children 40 – 100 pounds and from 40 – 57 inches tall. It has one-hand front-adjust Latch system, making self-buckling easier. There are 2 integrated cup holders, perfect for holding your child’s drink or snacks. There is a hideaway storage compartment for storing small games and toys. The Graco Affix booster seat is one of the best booster seat for a toddler. The Spectrum Booster Seat converts from a high back booster seat to a no back booster seat supporting children from 40-110 pounds. This booster seat features Evenflo’s latest advancement for side impact protection, LyfGuard. Lyf Guard has multiple layers of energy-absorbing materials that are made to compress upon impact, helping to reduce the risk of injury. It also features dual removable cup holders for drinks of all sizes and 2 snack trays that you can stow away when not in use. Its 9 headrest adjustments and wider seat base fits kids longer. 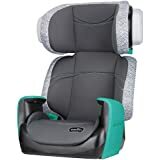 The Diono Cambria Highback Booster Car Seat fits children 40-120 pounds and up to 63 inches tall,. This 2-in-1 booster easily converts to backless booster. It has complete side impact protection with deep headrest and full body sidewalls enforced with EPS foam. It features an easy one-hand height adjustment for your growing child. 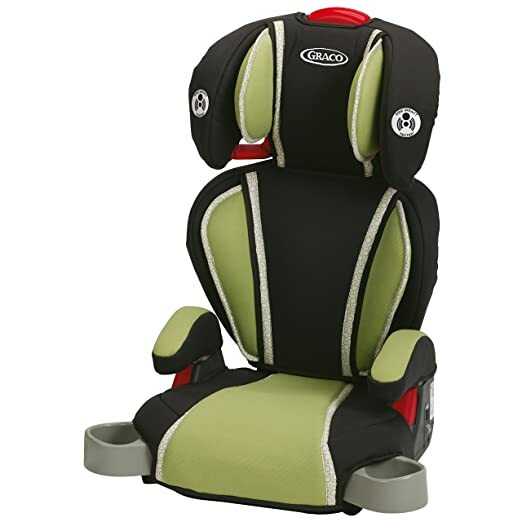 The Chicco KidFit 2-in-1 belt positioning booster car seat fits children from 30 to 110 pounds. It is an ErgoBoost contoured seat with double foam padding and it features DuoZone 10-position head and shoulder side-impact protection. There is also a 2-position backrest that adjusts to mimic vehicle seat position. There are 2 cup holders that you can fold away when they’re not in use. You can remove the backrest to convert the seat to a backless booster seat. This 2-in-1 Combination Booster Car Seat fits children from 22 to 110 pounds and from 28 inches to 57 inches tall. It converts from a 5-point harness booster seat to a belt-positioning car seat. The Chase LX combination booster seat protects harnessed children from 22-40 pounds and belt-positioned children from 40-110 pounds. 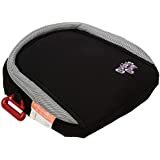 This is a great 5 point harness booster seat for over 40 pounds. This lightweight booster seat is equipped with LATCH systems, including tether, for easy installation. The Evenflo Chase combination booster seat has 4 shoulder harness and 2 crotch strap positions to accommodate your growing child. 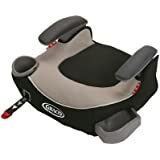 It is one of the best booster seat with harness. 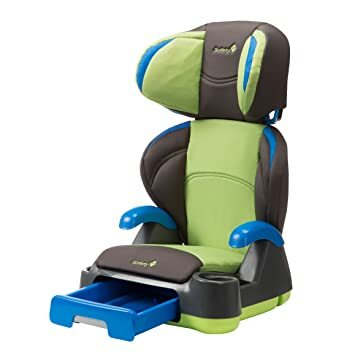 This booster seat also features integrated cup holders without increasing the width of the car seat and allowing multiple car seats to fit in your back seat. 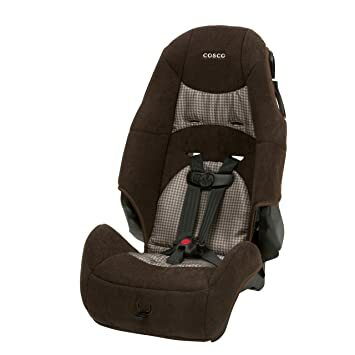 The Cosco Finale booster car seat is one of the top affordable 2-in-1 booster seats. It fits children from 30-65 pounds in the harnessed forward-facing position and from 40-100 pounds in the belt-positioning booster position. 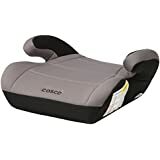 The Cosco booster car seat is a slim booster seat and it is one of the best booster for 3 across. It features a cup holder that detaches for use on either side of seat. This Bubblebum booster car seat fits children from 40 to 100 pounds. 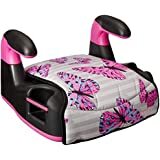 What’s unique about this car seat is that it is inflatable, foldable and portable. It weighs less than 1 pound and comes with a convenient tote bag and positioning clip. 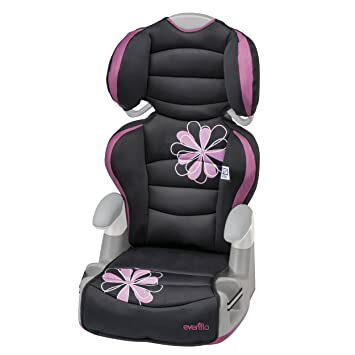 Lightweight and convenient, this is one of the best booster seats for travel. When deflated, the seat measures 11.8 x 5.9 x 3.9 Inches and rolls up to easily fit into a handbag or a child’s backpack. You can easily inflate the seat by mouth within 20 seconds. When inflated, the seat measures 11 x11 x 4.5 Inches. You can easily fit 3 of these across the back of most vehicles. It is made of durable material, similar to that of a lifebelt. The air bladder is made from memory foam which adds structural integrity and comfort. Kids love it because not only is it safe, but it is comfortable. Each seat comes with a shoulder belt positioning clip for added safety and comfort. The Bubblebum car seat is perfect for vacation and car pools. The Graco Backless TurboBooster child car seat is one of the narrowest backless booster that fits children from 40-100 lbs and up to 57″ tall. At just 16 inches wide, it can easily fit into small spaces, making it one of the best booster seat for a small car. This toddler car seat booster features padded, height-adjustable armrests for extra support and comfort. There are also dual hide-away cup holders that fold into the seat when you need extra room. The Graco TurboBooster is a one of the best booster seat for a 4 year old. 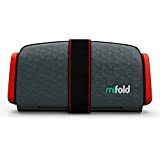 The mifold booster seat fits children from 40 to 100 pounds and from 40 to 57 inches tall. 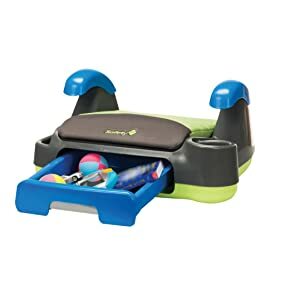 It is one of the best compact and portable booster seat. It is more than 10x smaller than a regular booster seat yet it is just as safe. In fact, it even folds up to fit into a child’s backpack, glove compartment or bag. This also makes it one of the best booster seats for airplane travel. You can easily carry one around without cluttering up a car or luggage. This Graco Backless booster car seat fits children from 40-100 pounds and from 40-57 inches tall. It is one of the best booster seat for a four year old. Its one-hand front adjust booster seat with Latch System secures the booster seat to the vehicle seat. The LATCH system keeps your booster in place and the front adjustment lets you quickly and easily tighten the booster to the vehicle seat. It is one of the best booster seat with LATCH. Its washable fabrics are removable and machine washable. There is a hide-away cup holder and a storage compartment. The Cosco Topside Booster Car Seat fits children from 40 to 100 pounds and from 43 to 57 inches in height. It features plush padding on the seat so your child can feel more comfortable during long rides. It is very light-weight so you can easily move it from car to car. The Topside is designed so that you can fit 3 in the back seat of most vehicles. It is a great option for growing families who loves to be on-the-go. 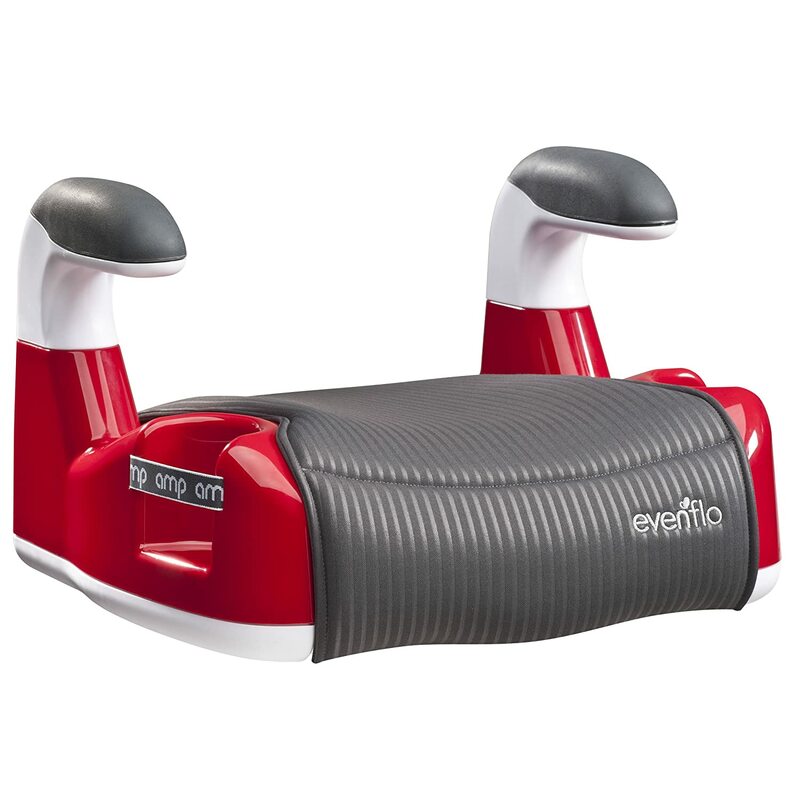 The Evenflo booster seat fits children from 40 to 110 pounds and from 40 to 57 inches tall. It features contoured padding, which makes it comfortable for long rides. There are also dual elastic cup holders and comfortable arm rests. There is a belt clip to ensure correct vehicle belt positioning. The car seat pad can be easily removed and is machine-washable. 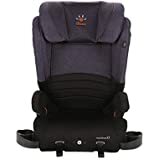 This entry was posted in Booster Car Seats on October 4, 2018 by admin.